Keith Harris has performed and taught all over the world. 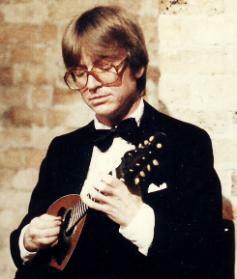 Keith Harris won first prize in a radio competition when he was 10, began teaching at 12, and gave his first 20 minute live radio recital (for the Australian Broadcasting Commission's "Young Australia" series) when he was 14. He has performed in every conceivable context - from intimate recitals in San Francisco, Sydney or Brussels to concertos as soloist with the Slovakian Philharmonic (left-at the world premiere of the Armin Kaufmann Mandolin Concerto) or the Vienna Mozart Orchestra. 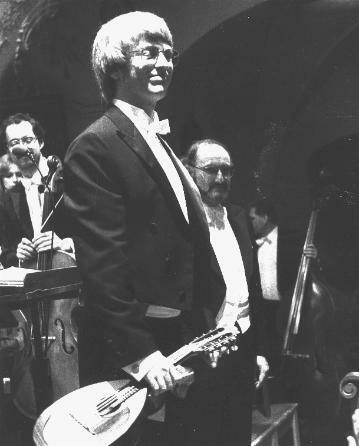 In 1990 multiple sclerosis, which had been causing him trouble for a decade before (it had not yet been diagnosed), finally put an end to his playing career - but not to his activities as teacher, conductor and composer! 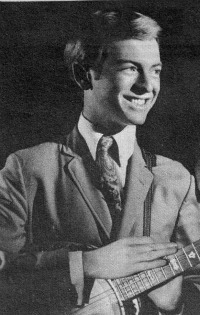 This picture was taken at a recital during a tour of Australia and Japan just a few months earlier.